Resolution, the UK insurer at the centre of a bitter takeover battle, has ditched its support for Standard Life's £4.9bn bid in its current form. The firm said the structure of the offer meant it could not go through without the backing of rival suitor, Pearl Group. After a buying frenzy on Friday, Pearl now holds 24.2% of Resolution shares, enough to block Standard Life's offer. Resolution said it would only recommend a deal capable of being implemented. But it added that it "continues to see real strategic benefit in the combination of Resolution and Standard Life". The market leader in closed life insurance funds, which do not write new policies, Resolution said it would engage both companies in further talks before making a recommendation to its shareholders. This neutral stance angered Pearl Group's management, which said it "has difficulty understanding why the board of Resolution is now not recommending Pearl's higher and more certain cash offer". "'Pearl urges Resolution to cease switching recommendations between a series of complex mergers, none of which it believes have strategic or commercial logic, and instead to recommend Pearl's increased all-cash offer," said chief executive Hugh Osmond. Separately, Edinburgh-based Standard Life said it was looking to restructure its proposed offer for Resolution, which currently requires 75% of Resolution shareholders to approve the deal. If it made a takeover offer rather than the scheme of arrangement currently proposed, the approval threshold would drop to 50%. "Standard Life continues to believe strongly in the strategic rationale of the transaction and remains convinced that its cash-and-shares offer provides compelling value," it said. The company also paved the way for possibly increasing its offer. A deal would be its largest since it floated its shares in 2006 and would create one of the UK's largest life and pension assurance firms, with seven million customers. Analysts said Resolution was unlikely to immediately switch to recommend arch-rival Pearl Group without giving Standard Life a chance to restructure its offer - which is currently valued at 716 pence per share, in cash and shares. Collins Stewart analyst Tim Young predicted that the bidding war would end near "the magic 750p-a-share that has been flagged time and time again". "It is true that having recommended Standard Life's previous offer, it would be slightly odd for the Resolution board to recommend a different one but there is nothing normal nor has there ever been about Resolution," he said. Suitors had been circling Resolution since it agreed to a 691p a share offer from Friends Provident in July. 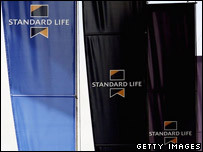 But on Friday a bidding war broke out after Resolution's directors recommended Standard Life's offer. This included selling £2.3bn worth of Resolution assets to fellow insurer Swiss Re. This agreement immediately severed the three-month-old arrangement to merge with Friends, which had looked to be nearing a conclusion. Less than an hour later, Pearl Group stepped into the fray, with an improved 720p-a-share, all-cash offer. The announcement blew the battle for the firm wide open, with raised bids now expected from the eager suitors. Closed life, or Zombie funds, are very cash generative and are highly attractive to life insurers which do write new policies as a means of funding new business, such as Standard Life and Friends Provident. Meanwhile, for Pearl, which like Resolution holds closed life policies, a merger would be an opportunity to grow its business in a sector where consolidation is the only way to expand. Pearl's offer is backed by mutual insurer Royal London.